It all started with “merger of minds” and now it has snowballed to this. Do you blame the SPDP President for speaking his mind to the press in this statement? One may ask,‘what do you know about the intricate details of politics in Sarawak where the Chief Minister of Sarawak knows since 1979?” He won his first contest in the Muara Tuang constituency and has seen it all in his 30 years in office. 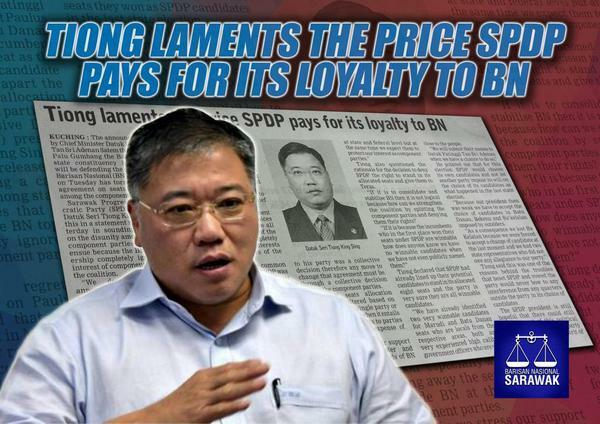 He too remembers the PBDS days where the party was at odds with the State BN but very much in tune with the Federal BN. Could this happen again? It will be a matter of time when it will unfold and the CM Sarawak is not making many friends from the SPDP,SUPP and PRS ‘merger of minds” coalition of BN partners. UPP/TERAS are BN friendly parties as the Ministers/Assistant Ministers/YBs sttod on Barisan Tickets at the 10th Sarawak elections. They are of course not Pakatan YBs? That’s for sure. There has been a lot of mudslinging amongst the BN component parties and obviously it is so unhealthy. The State itself does not want it to be too unstable as it will not be good for foreign investments in the long run. The time will be soon when Adenan decides to dissolve the assembly and call for fresh elections in 82 constituencies. If the bickering continues many pro-BN supporters will be looking over and above their shoulders and even will tell ADENAN a thing or two. CM Sarawak says’Bagi saya Peluang” but who are giving the voters and the people chance? Word on the ground is that its harder to make a living now than the final stable years of Taib Mahmud where everyone finds it so much easier. Of course, Adenan has taken the necessary actions against corrupt practises, demanding autonomy,looking after Chinese and Christians’ Allah” issue and other populists agendas to ensure a comfortable MANDATE. Will that be enough? One must remember that the literacy rate amongst the youths and the people have gone up and they will not be fooled by just popular jargons. Pakatan have had their fair share of promises to the people but everyone knows that DAP’Impian Sarawak” semi and rural drive are making headways. We do not need to put a blanket over our head and keep on harping all is well,all is well.all is well and BN with Adenan at the helm will win it for us. Adenan is one person and he will win comfortably in Tanjong Datu Constituency or even might face a no contest. Will all the other 81 seats be so plain sailing? At the moment according to our Emeritus Professor its going to be a battle not only pitting BN v Pakatan/Independent but also BN v BN friendly v Pakatan/Independent. PBB spokesman did harp on UPP/TERAS are in line with Najib’s call for ensuring the BN will win handsomely but with the outburst from SPDP President Tiong it will be anything but plain sailing. The BN principle comes very much to the fore for Adenan on the discussion table. Though Adenan has echoed the names of TERAS incumbents at his election dry runs that they will be standing it still will depend very much on how the situation looks nearer the election date. Word has it coming out from the ground PBB is his party but not the others PRS/SUPP/ SPDP or even TERAS or UPP. 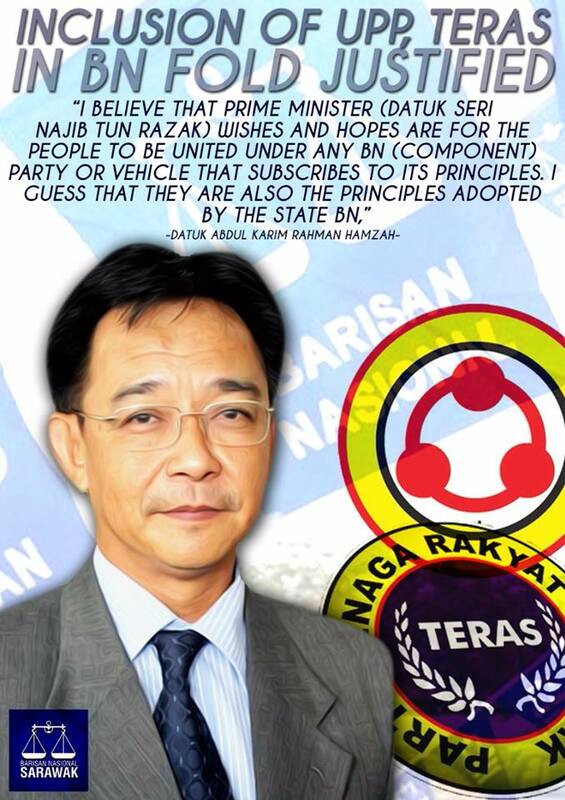 He is BN Sarawak Chairman and is the coalition head by virtue of his office. This statement was unheard of in his predecessors years. Its like we say,”TOUCH AND GO” and Adenan needs to listen to seasoned political strategists instead of listening to raw,gungho and untested green horn politicians who only want their best interest served instead of looking at Sarawak in totality. We have even heard that they want to RUN THE WAR ROOM. Gosh!!! We gave you the chance and we know in this social media age the pen and in this case the keyboard is mightier than the sword.. They know who they are and its bests that names are not mentioned or they will come after audie61’s back with more HATE AND VENOM. We are waiting!!! Till the next episode in a few days time.. Enemies are INSIDE and not OUTSIDE.. When we wrote the Trilogy way back in August 5th 2011 https://audie61.wordpress.com/2011/08/05/sarawak-trilogyroad-to-22nd-floor-finalwhose-my-boy/ we did say this,”The political shift and movement of forces are anything but cordial amongst the many political rivals to the chair. They may appear as friends in front with their pleasantries but once the backs are turned all ’hell’ is let out to wander. Today we were reminded that the PERCEPTION is otherwise. The enemy is indeed inside your own backyard and they have turn from being friends to being spies for a bigger ‘chests” which might just come along nicely. CM Taib and his deputy will no doubt stay on as we have mentioned in our previous article https://audie61.wordpress.com/2013/09/12/taib-mahmud-to-be-uncontested-as-president-2/ and it has a significant spiral effect on PRS too. James Masing and his deputy Joseph Entulu will also be reelected uncontested at the party’s TDC in Sibu on 19th September. CM have already indicated that he will in time make way but still the arrows and swords have not stop brandishing amongst the “greediness that looms” as sitting on the 22nd Floor Chair for Sarawak yields absolute power which the masters (i.e.enemies) yearn very much for. CM Taib watches with eagles eyes on the development within the PBB party in its elections but has eyes on UMNO which will no doubt affect the future administration of Sarawak in totality. Whose my Boy will be added flavour to many in the new UMNO lineup? The screws are being turned on many of the top leaders within the country and they are playing the PERCEPTION game which in itself is a very DANGEROUS APPROACH. In the end reality will bite in and many will be left to lick their wounds and some may even be left to rot in the abyss. The fighters will continue and the saying goes,” If you’re going through hell, keep going.’ There is nothing to loose so its time to reengineer….. This goes back to all the articles which we have written in the Trilogy and others connected with it and the following quote is so powerful….. The enemies within will use the tried and tested formula” allegations,defamation,character assassination” to hamper or put a hurdle in front to stop the rise of the so called vibrant and forceful leaders who are not in the same TEAM as them. This not only happens in the BN coalition but also within the Pakatan fold. We have been told on many instances that our writing is very “hot” for some to handle and its hitting at our own coalition. Like we say and we repeat it here which is extracted from the previous,”On this note we would also like to inform our detractors not to capitalise on this subject and to smear the blog. We have no doubt created ripples of discontentment but it is to ensure that the “MESSAGE IS DELIVERED” to those who harbours to create chaos and disunity amongst the ruling BN Sarawak coalition. READ BETWEEN THE LINES AND YOU KNOW WHO OUR MASTER IS…..If you dont know please dont read anymore of our blogs and stay in your own nutshell where you will be happy without outside interference. For those who love to defame and character assassinate audie61 please continue to do so and we wish you well…. The internal scheming stopped somewhat short of its tracks and finishing line with the articles which ended with https://audie61.wordpress.com/2013/01/20/awang-tengahs-men-pre-emptive-move/ but it was the earlier articles which checked mosts of the daredevils who have tarnished the PBB Senior VPs name badly and used it to somehow put a stop to his political career unknowingly. The plot hatched and used was the result of his fighting men and their overenthusiasm of overthrowing Taib Mahmud. The ENEMY IS YOU AND NO ONE ELSE…..NOW. You must know your Constituency Wants and Needs. You must REACH OUT TO THE GRASSROOTS and only then the voters will know whether you are sincere and can be trusted. The times are changing and one should be equip with all the knowhows , wheeling and dealing in the economic field too. We should also not Preempt anything but work towards achieving it . Minister of Housing and Tourism Abang Johari telling audie61 at the sidelines of the Press conference who were with the visiting delegation of SPDP and SUPP members at a courtesy visit to his office. WORKING TOGETHER: SPDP vice-president Captain Zainuddin Hamdan (seated third right), SPDP Pending chief Audie Chua (seated second left) and SUPP Youth chief Tan Kai (seated second right) showing the logo of the charity show to Abang Johari (third left) after their courtesy call. KUCHING: All BN component parties in the state must step up their cooperation to improve communication between the people and the leaders. PBB deputy president Datuk Amar Abang Johari Tun Openg said this culture of working together had always been there from the start and was pleased to see young leaders continue the efforts. “Such cooperation has existed since many years ago and I personally had experiences working with other component parties. “The political landscape nowadays has changed. There is need to explore new directions in order to improve communication between the people and the leaders,” the Housing Minister said yesterday. He was speaking to reporters after receiving a courtesy call from the organising committee of ‘1 night with P195 and P196 Friends Charity Movie Show’ at his office. He pointed out that the contribution from young leaders was important, especially in the present challenging political environment. “It is important to work together to provide the best service to the people. “We have all the basic ingredients so we need the best chef to prepare the right food. “The best chef is always the most experienced and in BN, we provide the chef because we have the experience,” he said. He commended the programme as a very good initiative by young BN leaders that would enable BN to get back the Bandar Kuching parliamentary seat and defend the Stampin seat. The charity show is an initiative to strengthen solidarity and unity among BN component parties and will be shown at The Spring’s MBO on Aug 29. There has been so much negative analysis that the Federal Barisan National is and will not be ready for the GE13. The main reason is the drop of popular vote for BN from 63% to 55% and also the growing influence of the opposition in the semi-urban areas. The PM Najib has not been given a frsh mandate yet and what he has says a political observer is,”making use of the government of Abdullah Badawi former PM of Malaysia. Najib needs a fresh and a very convincing mandate and he needs to do it fast. He is also a PM who has not gone to the people within a year in office. Previous PM”s have very quickly asserted their own style with his own people serving him directly.” No matter how he reshuffles the cabinet it will still be recognise as Abdullah’s mandate and as such Najib needs to get rid of this tag which still holds onto his coat tails. The BN machinery is ready to face the opposition and the longer Najib holds on the worse it will be for him. Its like going into the football field thinking that the opposition has so many star players and your legs shiver and your body can”t move and you are a pale shadow of yourself. If BN are united as a group and coalition which sticks together like a bunch of bamboo sticks no one can break it up unless it loosens from inside. The Sarawak State elections does not determine the opposition are that strong that Najib is afraid. The whole country will have a GE and everyone in their respective States will be involved and as such the “winnable and right candidate” is and will be the peoples choice. BN and Pakatan will give their all but it will be the PEOPLE who will have the final say. Najib don’t wait too long or else the opposition will have too much firepower to end your tenure as Prime Minister Of Malaysia. 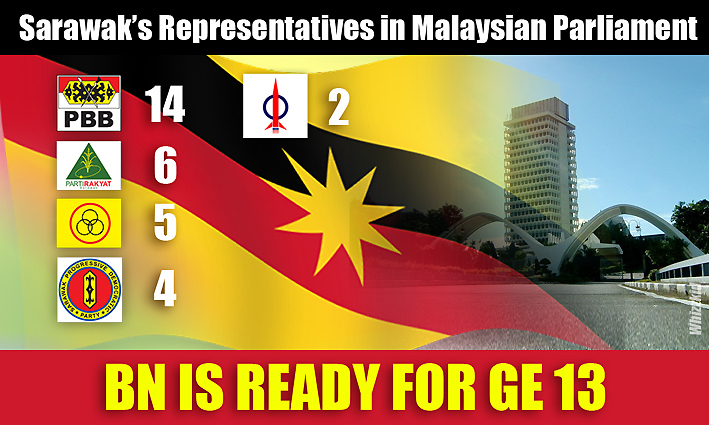 GE13 Sarawak is ready to do battle …..
Are their Signatures still HOT..??? The tears have almost dried up.Their eyes suddenly still lit up after so much disappointing outings. They had their finest hours as MPs in Tatau and Julau respectively and these political characters has reverberated the Sarawak political landscape in their prime years. We are talking about Sng Chee Hua and Ting Ling Kiew. One is a former Deputy President of PRS while the other is Deputy President of SNAP. Much has been written about them the last few days in the mainstream local english, chinese tabloids and also in the internet Blogs. There were cries of disgust,trojan horses and also nods of approval from BN. Are they still relevant? What makes them so special or feared? Is another political party in the offing in Sarawak? Has the Lions suddenly realised that its time to come back to their cages..? What is so special about them?Are they renewed partnerships and a smell of LOSTS POWER regained? Sng has come out with a three paragraph statement stating his stand as a ‘Barisan National Man” while Ting expressed full support for incoming premier Najib Abdul Razak . Personal agenda’s one may ask.? This is politics at the highest levels and we must never ever discount anyone out as it will come back and HAUNT YOU. There are no enemies in politics BUT mostly friends do become enemies. Political analysts are already spinning their wand and saying,”that these two has been given the tasks to monitor and to update information to the incoming PMs political boys on matters of concern. Both sides of the political divide has had a lot of say in the last few days. We can only View this Development as something which will generate into a more viable vehicle if they both have been tasks to start another ‘ POLITICAL ENGINE “. Never ever say never in Politics and also NO WAY…!! Stranger political bed partners have emerged overnight and we do hope that this might just be a breaking story in making the political landscape of Sarawak more interesting. We say as always,” It is BN’s gain while Pakatan would be saying to them,”GOOD LUCK…or will they just say that..hahaha..??? Bloggers… Why?Why?Why? 3 Whys on Batang Ai N29? It was more than 2 whys when I touched down at Kuching International airport this evening. This is an extract from a conversation which I had with a senior journalists/political analysts at Mcdonalds restaurant this evening. Its meant to happen and this is the first why? My phone was off and as I landed in Kuching there was a message. It seems a day away from action packed newsapapers in Sarawak has awaken the journalistic feelings of one who never seems out of touch with the realities of everyday Sarawak. Seems for two consecutive days,the bloggers have been under attack.There is no need to mention WHO and the readers have already envisaged who. Never the who but question the WHY WHY and WHY the bloggers? Are they being feared? It’s a food for thought and it seems the bloggers have indeed ruffled the state administrators that they have to come out and say a thing or two. Do they need to…??? Its a ‘People’s right” and with the advancement of IT savvy technology the public would seek an alternative and has a right to seek a balance of alternatives in this political divide. The people will be the judge to associate themselves with the mainstream media or the alternatives. There has been too much SWEEPING STATEMENTS of late on BLOGGERS. According to the senior journalists blogs provide important information and its an avenue for citizens journalism. We need to use the technology that is before us and a blog serves as a ‘personal diary” With blogs its an invention and things are more open. It is away from the norm and the mainstream media knows that they have a competitor and its a NEW MEDIA TOOL. This is the NEW REALITY of the IT ERA. Unless if and when BN adminstrators or YBs wake up and accept this new trend or new media their days might just be numbered. There is no need to criticize the who and why who has written but to view it as something constructive and do some evalution or a case study. There is nothing to hide and whether you like it or not the POLITICAL LANSCAPE IN SARAWAK HAS CHANGED.The IT era brings about greater democratisation across the nation of Malaysia and Sarawak is no exception. To condemn outright the Sarawk blogs and therefore deny the PUBLIC an alternative new source is tantamount to insulting the intellect,educated public and putting a brake on DEMOCRACY. There is an upsurge of public interests in the blogsphere of personal opinions and if they are positive the government should adopt the ideas but if they are malicious and spreading unnecesary lies there must be a stop on the nonsence. Its up to the governement press/media boys to churn out a statement to deny or rebutt with statements to the blogs. There are ways to look at it and different ways are needed as if not we are entering a political minefield. Why should we do the work of those who are supposedly paid in the thousands by the political masters? WHY?WHY? WHY…??? should be Correct,correct and correct…!!!! Facts,figures,statistics they say never lie and all ruling government thrives on information technology. James Masing PRS President must have enough evidence to substantiate his claims in the chinese dailies or else he would be getting himself in a bigger HOLE against his former deputy. BN has got enough supporters and its no use to ever think of making use of people who goes against the principles of the BN spirit. BN in times of trouble needs the true soldierss and captains to fight for their cause and Pakatan would also do likewise. Is there a place called IN THE CENTRE..?? Bloggers they say, are here to stay and unless the internet/cyber space is shut down for good the BLOGGERS have a place called home IN MALAYSIA. We say as always,” Let’s be honest and say Kuddos for Bloggers or else the mainstream media newspapers will take things easy and for granted.WHY..there is no more WHY..?????? The phrase ‘ Women’s instinct ” must not be discarded in this byelection campaign. Womenfolks make up around 45% of the total votes in Batang Ai and they are placed of utmost importance says both sides of the political divide. PKR and BN wanita movements have started their programmes to coax and to ensure that the votes are secured. The women folks in the Batang Ai longhouses practically live a very simple life tendering to their families needs. They are not really concerned about what really is happening politically outside their longhouse boundaries. The women wings of both the parties will use all their women persuasive powers and not forgetting their instincts. Surely if $$$$$ are offered as assistance it will come in handy though it might just be a temporary relief for their basic needs. In any elections there will be talks of “MONEY POLITICS” “BUYING VOTES” plus all the usual niceties that comes along with MONEY. Nobody will come out be it BN or PKR dare to declare that we DID NOT USE ANY MONEY IN THIS RURAL CONSTITUENCY. Women folks play such a significant role in this rural remote area and their votes will also determine in the final analysis who wins. To forget the women voters the candidates are doing so at their own peril. The candidates wife would be another crucial factor in N29 and we all know too well that,”Behind every successful man……………” Do I need to finish the sentence and say some more..!! !